As an IT specialist I tend to spend most of my time working on a repetitive cycle of issues, I’ve lost count of the number of times I need to reset a router, or clone a failing hard drive, or change a website to improve seo. But once in a while a problem comes along which redefines the way I think about technology. However Angus is bright, smart, has a crazy sense of humour and can deliver straight talk like no one else I know. Angus is also profoundly deaf and his eyesight is failing. For many years now Angus has become incredibly reliant on his computer as one of the main ways of communicating with friends, family and trades-people. Should his computer ever go wrong then we are quick to get him back up and running, otherwise he becomes isolated very quickly. When I visit Angus I will use his keyboard and screen to communicate with him. I am lucky, my one fingered typing is quite speedy and so we can correspond in near-to-real-time. However other tradespeople have to communicate via slow careful speech to allow Angus to lip read or pick up their voices through a highly amplified hearing aid. Because Angus has limited hearing he was unable to use the telephone and this meant that a general conversation with friends and family was always limited to email. He was effectively locked in, with no ability to be able to converse long distance without typing long emails or messages. Following on from this, and following further research by Angus on the R.N.I.D website, we identified a new technology from a company called Pedius which used a speech to text app to create a tablet based communications device. The system works by ‘listening’ to the incoming voice and then translating it into text on the tablet screen. Angus simply talks back and the caller can hear his voice. To all intents and purposes the two parties are talking to one another. For those of you who were brought up on technology this is an ideal solution, but of course Angus was not brought up in a computer based world. In fact Angus still remembers his 14th Army days where communication was by field radio with ‘Over’ an important part of every communication. To really make this solution work, we had to identify exactly the right tablet (large enough and bright enough to see, whilst small enough to hold comfortably). 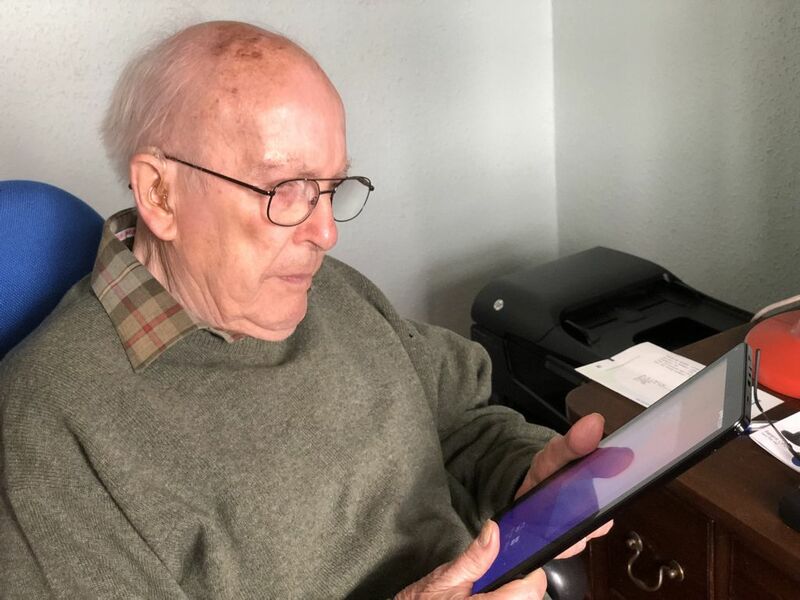 We also had to preconfigure the app software to make it accessible for Angus and finally we had to create step by step instructions from powering on the tablet through to making a call and finally to terminating a call. The outcome of all the effort (especially by Angus) paid off. In the first week of November, late one evening I saw an incoming call with a number I recognised. I had a meaningful conversation with Angus by simply speaking to him and listening to him speaking back. I will freely admit that for me it was an incredibly emotional moment. We had unlocked an area of Angus’s life which had been closed for many years. He can now correspond by voice with friends and family in a way which had been lost to him. The next time you look at another piece of technology and take it for granted, stop for a moment and think about how it might help others, because sometimes technology really can change lives!